This Purchase Agreement is designed for the acquisition of an office building presently occupied by the tenant purchaser, but in this case, the building to be acquired is located on a ground leased parcel with a third party ground lessor. As a result, the Purchase Agreement contains a termination agreement (with the form attached as an exhibit) for the existing office lease to be held in escrow and delivered at the closing. In addition, the Purchase Agreement contains (also as exhibits) a bill of sale and ground lease assignment, and a ground lessor consent and estoppel certificate. Lease Termination Agreement; Bill of Sale and Ground Lease Assignment; Ground Lessor Consent and Estoppel Certificate. This Agreement of Purchase and Sale (“Agreement”) is made as of ________________________ (“Effective Date”) between COMMERCIAL PROPERTY LANDLORD, INC., a __________________ corporation (“Seller”), and FORMER TENANT PURCHASER, INC., a _________________ corporation (“Purchaser”). Subject to the terms and conditions of this Agreement, Seller will sell to Purchaser, and Purchaser will purchase from Seller the Property (as defined below), including an approximately ___________ rentable square foot office building located at _____________________ (the “Building”). The land underlying the Building is not owned by Seller and is subject to that certain Ground Lease dated _______________________ (the “Ground Lease”), between the Seller, as lessee, and the GROUND LEASE LANDLORD, as ground lessor (“Ground Lessor”). (d) The “Intangible Property,” being all, right, title and interest of Seller, if any, in and to: (i) all intangible personal property now or hereafter used exclusively in connection with the operation, ownership, maintenance, management, or occupancy of the Real Property (to the extent assignable); (ii) the plans and specifications for the Improvements (to the extent assignable); (iii) warranties, indemnities, applications, permits, approvals and licenses (to the extent applicable in any way to the above referenced Real Property or the Tangible Personal Property and assignable); and (iv) insurance proceeds and condemnation awards or claims thereto to the extent provided be assigned to Purchaser hereunder. 1.2. Purchase Price. The total purchase price to be paid to Seller by Purchaser for the Property shall be _________________ DOLLARS ($_________) (the “Purchase Price”). The Purchase Price, as adjusted for prorations, deposits and other adjustments as provided herein, shall be paid to Escrow Agent by wire transfer of immediately available funds or in cash. 1.4. Title Company and Escrow Agent. The “Escrow Agent” and “Title Company” are: ____________________. 1.5. Closing Date. The “Closing Date” shall mean ____________. (c) Cooperation. The parties shall cooperate in good faith and with reasonable diligence to secure Ground Lessor’s Consent prior to the Closing Date. 2.2. Office Lease. 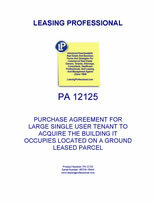 Upon the Closing, the Lease Agreement between the parties hereto dated as of _______________ (the “Office Lease”) shall terminate (the “Office Lease Termination”) and the $________ security deposit tendered by Purchaser under the Office Lease (less the amount of any unpaid monetary obligations of Purchaser as the Tenant under the Office Lease which accrued prior to the Closing, including any outstanding rent, at the Closing) shall be credited to Purchaser against the Purchase Price at the Closing. (c) Leasing Arrangements. Seller will not enter into any lease, sublease of space or other occupancy agreements affecting the Real Property, and any and all amendments and supplements thereto, and any and all guaranties and security received by landlord in connection therewith without Purchaser’s prior written consent. (d) Ground Lease. Seller covenants and agrees not to modify the Ground Lease and to comply with the terms of the Ground Lease to the extent such compliance is not the obligation of Purchaser under the Office Lease. (e) Exclusive Negotiations. Seller shall: (i) remove the Property from the market, and (ii) not actively solicit or negotiate with any other prospective purchasers of the Property. 2.4. Damage. Upon the Effective Date, the full risk of loss with respect to the Property shall pass to Purchaser and shall remain with Purchaser after the Closing and delivery of the Deed (as defined below). Purchaser shall promptly give Seller written notice of any material damage to the Property, describing such damage, whether such damage is covered by insurance and the estimated cost of repairing such damage, provided that such damage known to Purchaser. For purposes of this Section2.4, “material” means damage in excess of $100,000. Seller shall transfer and assign any insurance proceeds or rights thereto to Purchaser at the Closing. This Agreement, and the parties’ obligations to purchase and sell the property, shall survive any such damage to the Property. 2.5. Condemnation. Seller shall promptly give Purchaser notice of any eminent domain proceedings that are contemplated, threatened or instituted with respect to the Property. Seller shall, at the Closing, assign to Purchaser its entire right, title and interest in and to any condemnation award, and Purchaser shall have the right during the pendency of this Agreement to negotiate and otherwise deal with the condemning authority in respect of such matter. This Agreement, and the parties’ obligations to purchase and sell the property, shall survive any such proceedings.